In the class period following the administration of the Pre-Project Assessment I introduced the project to my students. At this point we had finished covering the content for the unit that they would need to complete the project, in particular the academic language associated with scientific descriptions of heat flow. They were given 10 days total to complete the project. We devoted three class periods to working on the project. I started off by passing out the assignment guide which included (among other things) the objectives, standards, and suggestions for topic ideas. I asked the students to take a minute to quietly read the project objectives. Once this was done I asked my students to describe to me what they should include in the project based on the objectives. As they shouted out ideas I wrote them on the Promethean board. There were suggestions such as “an arrow showing where the heat goes,” “labels for the system and the surroundings,” and “endothermic/exothermic label.” We used this as a checklist for what my students would need to include in the project. In this way I incorporated the idea of bounded choice. Although my students had free reign to choose their project topic, they still had to include specific content. Once we had a clear idea of how the project should look, I showed my students the sample I had made. We compared my sample to the checklist they had just created and the students agreed that the sample met all of the objectives. After this introduction, I released my students to come up with a project topic and begin researching and creating their presentation. Even though I provided a list of topic suggestions, I informed my students that they could absolutely go “off menu” and choose a different topic that interested them. During this time I went around the classroom to help students come up with topic ideas, start their research, and/or decide what type of presentation medium they would use. Some students struggled to decide on a topic. I helped them make a decision by either directing them to the suggested topics or by asking them, “What are you interested in?” We would work together to figure out if they had an interest where heat flow was present and turn that into their topic. 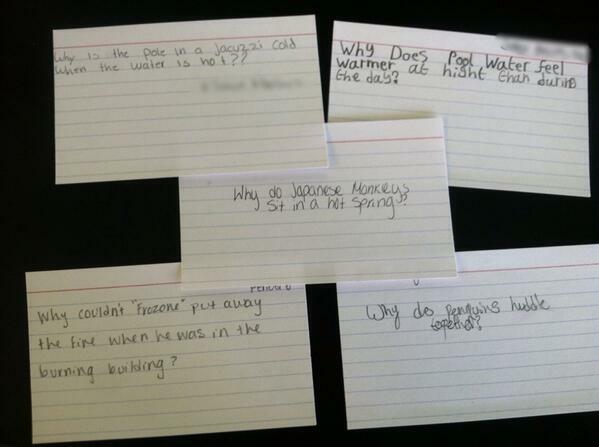 As an exit slip my students had to submit a central question they would answer with their project. They came up with a variety of different questions, some of which are shown here. One of my primary reasons for conducting this research was to look at what drives motivation in my students and if having a choice in their assessment influences motivation. In particular, I want to see if choice increases intrinsic motivation. My primary tool for measuring motivation was observation. In particular I observed how enthusiastic and focused my students were throughout the project. Enthusiasm and focus were the indicators of motivation in this research. Once my students had chosen a topic, they began diligently working on their projects, researching their topics and searching for images to use in their presentations and posters. In the days that followed I had several students email me or come in at lunch to discuss ideas for their projects. This was a rare occurrence. I can count on one hand the number of times students have contacted me outside of class this entire year. I was encouraged by these observations. It appeared that my students were intrinsically motivated to create these presentations. They had chosen topics that they were genuinely interested in and were excited to share their ideas. On the second day of in class work, however, this motivation vanished. Many of my students had either a project due or a rote memorization test in another class. Rather than using the time I gave them to work on their projects, they were finishing up their projects for their other classes and drilling each other for their impending exam. It was as if the immediacy of those assignments trumped their initial enthusiasm about the project in my class. It became such a problem that I had to stop the entire class and ask them to put work for their other classes away and focus on chemistry. When they had finally refocused on the task at hand a new problem emerged. Several of my students who were initially enthusiastic about their topics had their cell phones out playing games or logged onto social media. I asked these students to work on their projects, but many complained that it was too hard. They had these fantastic questions but didn’t know how to answer them. They couldn’t find the answer online, so they just gave up. It brought to mind two issues for me. First was the struggle my students have had with bridging between knowledge and application. While they do fine recalling information, they have struggled in the past to apply this knowledge to new situations. Second was from Carol Dweck’s research on mindsets. It appeared that my students were exhibiting a “learned helplessness” mindset rather than a “mastery-oriented” mindset. When they encountered an obstacle in their project (not being able to Google the answer) they gave up and waited for me to set them on the right path rather than persevering and seeking a solution on their own. Although the second day of in class work on this project was plagued with motivation issues, motivation picked up steam on the final day: the due date. On the due date more than one student stampeded into the classroom asking if we could spend the day finishing the projects, which I had been planning to allow anyways. Throughout the class period my students were focused and motivated, racing to finish their projects by the end of the period. That due date was quite the motivator on this final day. Like motivation, engagement fluctuated throughout the three days we worked on the project in class. Engagement in this research was measuring if students were on task and putting effort into their projects as well as if students were completing their projects. My primary indicators of engagement were on task vs. off task behavior, turn in rate, and my students' self-reported effort. I measured engagement in class by noting on my seating chart/observation guide which students were off task as best I could. On the first day, when motivation was high, there were very few students off task, about 25% of my students. Those who were off task were the students who have a history of disengagement in my class. On the second day, when motivation dipped, over half of the class was off task. On the final day engagement was even higher than the first day as my students were trying to finish their projects before the end of the period. The quality of work my students turned in was also an indicator of their engagement with this project. I felt that the majority of the projects were very high quality. It was clear that my students had put a lot of time and effort into creating thorough, visually stunning projects such as those pictured below. This was supported by student reflections on their projects. 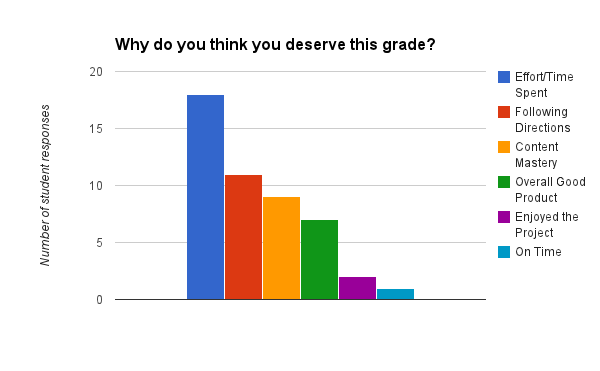 In addition to administering the Post-Project Feedback Form I created in my assessment plan, I asked each student to score themselves on the rubric, then on the back answer the question, “Why do you think you deserve this grade?” Each student gave one of six responses, shown in the chart below. 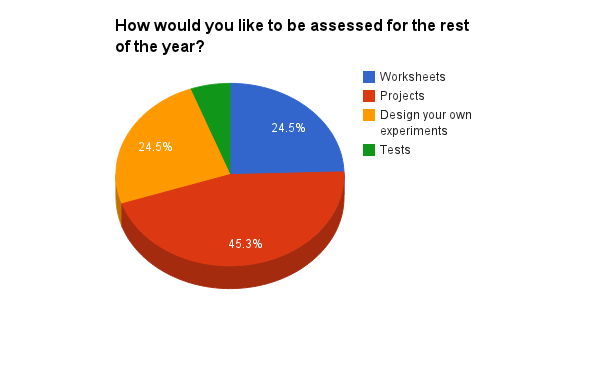 The majority felt that they put a lot of effort and time into their projects. They wrote, "I worked really hard on this project and spent a lot of time on it," or, "I deserve this grade because I followed all the directions and included everything in the objectives." Finally, the turn in rate for this project was higher than the packet. For this unit my students had both this project as an assessment of content knowledge and a worksheet packet which I used as a conveyance for the content. While 72% of my students turned in the project, only 57% turned in the packet. In the projects my students turned in there was a high level of content mastery. Upon analyzing the rubric scores, only 7 students out of the 46 who turned in their projects had misconceptions about the concepts and did not meet the content objectives. All students who turned in their projects received passing scores, and all but the 7 previously mentioned received "Advanced" or "Proficient" scores in the content section of the rubric. However, this was not reflected in the test scores. For the previous two exams, 47% of students scored below a C. Even though the exam covered the same content as this project where most of the students exhibited content mastery, 46% still scored below a C on the exam which is not a statistically significant difference compared to the previous two exams. There may be several reasons for this discrepancy. The content of this exam may have been harder than the previous two exams, although I don’t believe that is the case. It may indicate that my students are still having issues bridging and applying their knowledge to new situations. It may also be because of the test itself. The questions are taken from a question bank designed to assess the state standards. I did notice that my students were struggling with the language on this exam. Even those who are high performing students and native English speakers were confused about what the questions were asking and didn’t know what some of the words meant. After this project I polled my students, once again asking them if they thought science was relevant to their life. Initially only 64% of my students believed that science was relevant to their life. After completing this project that number jumped to 82%. In their Post-Project Feedback, quite a few students stated that the project helped them understand the subject better because they could see it applied to real life situations. Moving forward I would like to continue to incorporate choice in such a way that students can engage with topics that they believe are relevant to their lives. By doing this I can continue to reshape their perceptions of science as something that is limited to the classroom. On the feedback form I asked my students “What was the best part of this project? Why?” The majority of my students responded that being able to choose their topic or their presentation format was their favorite part. The theme of choice as a good thing came up in nearly every student response. Students often indicated that the best part of choice was "the fact that I could choose my own topic and it was based on a real life situation.” One student even addressed how choice in assessment meets the needs of different students writing, “Getting the freedom to choose what we wanted to learn about and base our project on [was the best part]. I believe school should be more individually based on the student, everyone learns differently." The word cloud below illustrates how frequently students responded with some variation of being “able to choose my topic.” Clearly choosing a topic of interest was something my students enjoyed which may have contributed to motivation and engagement. This was created using all student responses to the question "What was the best part of this project? Why?" Words appearing larger occurred more frequently. When asked “What advice would you give to a teacher starting this type of project?” most students responded that they wouldn’t change anything; the project guidelines were clear and the inclusion of choice made the project more interesting. Students wrote, "I liked the amount of choice the students had and freedom to choose a topic and style of project. There really isn't anything I would change about it," and “I wouldn't change anything, I liked doing this project.” As I move into phase 2, I want to continue to offer choice of topic to my students. It has been one of the most positive aspects of the project in phase 1 and I believe that it directly contributed to the increase in motivation and engagement. Since my students didn't see any need for changes to the project, I would keep a similar structure. Having students choose topics also helps them see the relevance of science because they typically chose topics that were relevant to them, from video games to swimming pools to Starbucks coffee. One of the questions I asked my students in the Post-Project Feedback Form was “Did this project help you better understand thermochemistry? Why or why not?” The responses were overwhelmingly positive. Only two out of the 42 students who submitted their feedback felt like the project did not strengthen their understanding of the content. The majority of students either said that it helped reinforce what they had learned or created understanding where there wasn’t before. One student wrote, “The best part of this project to me was fully understanding the concept of this project. There was a point while I was doing this project where thing just clicked in my head and I got a good understanding of the concept of what we were learning about.” Another student wrote, "I studied all about it myself and was able to figure it out based on what I learned in class and on my own.” Yet another student wrote, “This project helped me understand it better because it isn't bounded by worksheets. We had to explore outside of the book to find out things about the question being done. For example, the book doesn't explain heat flow in Frozen.” In this project there wasn't a single right answer. Each student needed to apply what they had learned in class to a specific situation. This forced them to go beyond textbook answers and copying their neighbors and actually think about the concept in the context of their own topic. Because of this the majority of my students ended up with a deeper understanding of the concepts than they would have had they only been assessed by worksheets or exams. The way my students gravitated towards the idea of worksheets and packets made me wonder if they knew how a scientist would share their knowledge and if they realized that worksheets and packets are not really authentic assessment pieces. One day after the project was done, I decided to do a whole class discussion and asked my students to tell me how they thought a scientist would share their knowledge. Their responses were surprisingly accurate: interviews, presentations, journals, discussions, seminars, and meetings. Finding this discrepancy between what a scientist would do and what my students wanted to do fascinating, I decided to delve deeper into the idea of my students as scientists. I followed up my initial discussion question about how scientists share their knowledge with this: “When does a person become a scientist?” There were several different responses. I immediately followed up this inquiry by polling my students, asking them if they considered themselves scientists. An overwhelming 72% said they didn’t. My students do not position themselves as scientists.